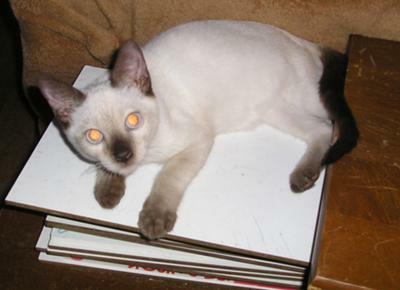 Supapan was my first Siamese. She was a Modern show-quality Seal Lynx Point and White, and had huge, vivid dark blue eyes. She was named after a Thai student I once had in class, and her name apparently means 'Little Doll'. Unfortunately, she died of kidney failure at the age of nine. After she died I was distraught, and who should come into my life but Mongkut. He came from an 'Oops' litter - so he's 3/4 Modern Siamese and 1/4 American Curl. He looks like the old-fashioned Siamese - he's thicker than modern show cats, and his ears aren't as big, but he's still more slender than most cats. He's now six months old, and it's clear that he isn't a Seal Point - I think he's Chocolate, but he does show some pale barring on his legs and the tabby M on his forehead. His father was a Lynx Point, so I don't know, but I think he's really just a Chocolate Point. He's named after the King of Siam, made famous in the movie 'The King and I', and later 'Anna and the King of Siam'. The king's royal name was Rama IV, but his personal name was Mongkut, which is now being used in general for Thai boys. But my Mongkut truly IS a king, and he knows it! The name Mongkut means 'Crown'. Welcome Natalie and thank you for sharing your pictures of Supapan and Mongkut. 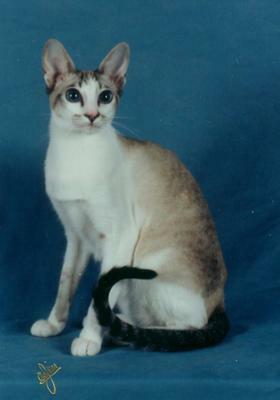 Supapan was a beautiful example of a Modern-type Siamese cat, very slender, with her large ears and long limbs and tail. Mongkut is gorgeous and I think you're right, he does look like a Chocolate Point to me with his very pale, almost white coat. It will be interesting to see how he develops as he gets older and whether his stripes, and the Lynx Point side of his family, come forward at all. I love their names; it's lovely that you chose such authentic Thai names for them both - I particularly like 'Little Doll' (Supapan) - perfect. Oh, and I love the idea of an 'Oops' litter, as well!